The firebrand cleric who led a militia blamed for American deaths and ethnic cleansing has distanced himself from former patron Iran. Anti-American cleric Muqtada al-Sadr, whose fighters clashed with U.S. troops after Saddam Hussein was driven from power, has recast himself as a bulwark against Iranian influence as Iraqi voters head to the ballot box. Al-Sadr's Shiite militia known as the the Mahdi Army was blamed for the mass killings of Sunni civilians in sectarian violence that wracked Iraq in 2006 and 2007, and for cleansing Sunnis from parts of Baghdad. While al-Sadr is not standing as a candidate in Saturday's national elections and is not officially a political leader, he has thrown his weight behind the Revolutionaries for Reform Alliance. That six-party coalition includes his supporters as well as Iraq's Communist Party. Running on an anti-corruption platform, the alliance includes Sunnis and Shiites, Islamist and secular Iraqis. Al-Sadr has distanced himself from former patron Iran, and has cultivated the image of himself as an Arab nationalist. He is working to improve ties with Iraq's U.S.-allied Gulf neighbors like Sunni power Saudi Arabia, a regional rival to Tehran. But the cleric remains controversial and feared, with some in Iraq and abroad recalling his links to violent sectarianism. And al-Sadr remains a fiery critic of the U.S. Regardless of where his political views stand today, al-Sadr has benefited from Iranian support in the past, and even lived in the country for a few years. And while he has “positioned himself as a counterweight against Iranian influence,” he is also the author of many of Iraq’s problems, according to Ranj Alaaldin of Washington-based Brookings Institution. The Mahdi Army fueled the country’s devastating sectarian war in the mid-2000s and engaged in widespread corruption, according to Alaaldin. Al-Sadr's Peace Brigades — as the Mahdi Army is now known— also recently joined the war against the Islamic State. This weekend's vote is the first since Prime Minister Haider al-Abadi declared victory over ISIS, thanks in part to Iran-backed militias. Such paramilitary groups have been instrumental in ousting ISIS from much of Iraq, and in the process, have deepened Tehran's hold on its neighbor. Many of the Iran-backed militias have been accused of horrific abuses against civilians, particularly Sunnis, and are opposed to America's presence in the country. Their growing clout has raised the specter that they will grow to dominate the Iraqi political scene much like Hezbollah does in Lebanon. “Al-Sadr is the only one who can stand against the Shiite militias’ influence in Iraq because he is not implementing the Iranian plan,” said Naser Mohammed, a Sunni Muslim from Baghdad who plans to vote for a party in al-Sadr's bloc. “In the last few years, [al-Sadr] has started to get closer to all Iraqis, including Sunnis,” added the 46-year-old who works in the finance section of Iraq’s Health Ministry. Iraqis head to the polls against a backdrop of widespread power outages, poor public services and disastrously low oil prices. With around 7,000 candidates, no single alliance looks set to win a majority of the 329 parliament seats up for grabs as al-Abadi, former Prime Minister Nouri al-Maliki and candidates with close links to Iran-backed militias battle for electoral supremacy. 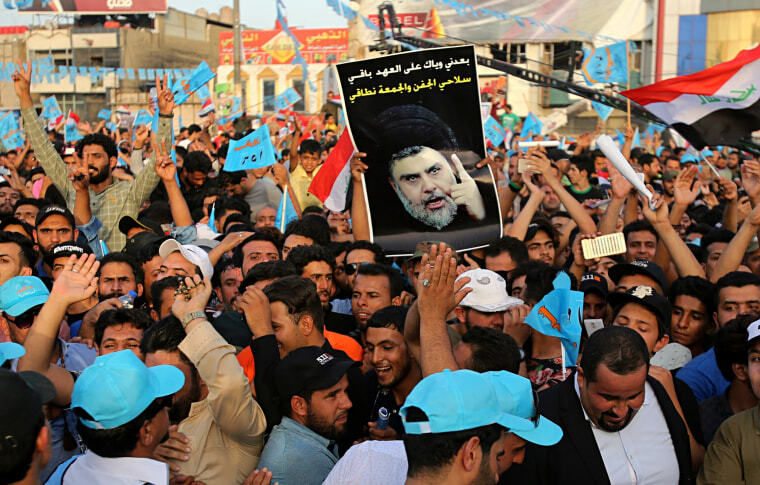 With popular discontent running high, Revolutionaries for Reform is expected to win enough votes to make al-Sadr a key player during negotiations over the formation of a coalition government. The cleric's shift away from Tehran is vital, Sarmad al-Bayati, an independent political analyst in Iraq. He is “an Iraqi, his father and grandfather were famous religious men who lived in Iraq among Iraqis, so that he feels that he belongs to Iraq not to Iran,” al-Bayati said. Al-Sadr remains fiercely opposed to the U.S. in Iraq — something that many Iraqis agree with 15 years after the invasion plunged the country into chaos. The U.S. maintains some 5,200 troops in the country.